Spring breaks can be exciting without spending loads of cash, which might come back to haunt you later. While there is a lot of hype about taking trips to exotic locations, it isn't necessary. There is so much to explore in your own country; in your own vicinity and, sometimes, exploring your own surroundings will give you not only a break from your routines but you will have learned something about "home." Time demands our attention. It doesn't relent, nor slow down, for us to do things we would like to do on a regular basis. Spring break is the perfect opportunity to break away and enjoy ourselves doing the things we love most. If you enjoy spending time in the great outdoors, pack a lunch, a couple bottles of water, and a camera with an extra set of batteries. It also wouldn't hurt to take a small amount of cash with you, just in case you decide to be spontaneous, and a cell phone, if you have one, but turn it off. Only use it in case of an emergency. This is your time to relax and you don't need to be interrupted by continual phone calls. That's part of normal life and you want to get away from that for a little while. Being sure to tell someone you trust of your whereabouts and the time you expect to be back, set out to explore your favorite hiking trail around mid-morning. Take photos of anything that captivates you. It may be a tree with bent and twisted branches or a squirrel holding an acorn. Perhaps you'll see an animal not common to the area, and one never knows what type of bird might fly overhead. Perhaps the sun will position itself over a group of trees and make a fantastic shot. You may even wish to lie on the ground and take photos of the treetops and the clouds. Find your favorite spot, close your eyes, and think of the happiest moments of your life. You'll notice your thoughts drifting from one place to another; from one person to another, and the stress you've been feeling will melt away. 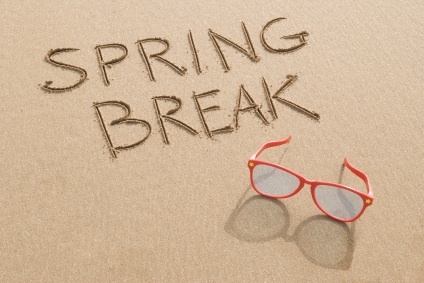 You'll feel rejuvenated and ready to conquer the world...all this on the first day of spring break! On day two, perhaps you'd like to do something different. Sleep in a little but, by early afternoon, take your bicycle, skateboard, or roller blades and get some physical exercise. If you don't have either of the above, perhaps you may be able to borrow from someone or rent a bicycle for an afternoon, or visit a gym or swimming pool. Armed with a turned off cell phone, a small amount of cash, and a bottle of water, relax your mind and see where the road takes you. You may meet some interesting people along the way or run into an old friend. You may see a museum and decide to go in for a peek. You may end up at the library engrossed in a novel, or may end up at a friend's house for dinner. The possibilities are endless! Your body will feel great because you've had some exercise and you won't believe how relaxed you feel, mentally and physically. On day three, perhaps you'd like to partner up with a friend and explore a trail you've never hiked before. You might grow closer by having shared the experience. On day four, be a volunteer. Go to a homeless shelter and volunteer your services for a few hours. Help a bag lady wheel her cart down the road. See how the less fortunate live. You won't be able to forget the looks on peoples' faces - the hopelessness, helplessness, and the desperation to have a better life for themselves and their children. You won't walk away from these people and be the same person you were when you first entered their presence. On day five, visit the sick in the hospital. You might be surprised to know how many elderly citizens have no one to visit them when they are sick. A visit from you, though they don't know you, would be the highlight of their day, perhaps even their week, or month. You never know the stories you may hear, the wisdom which may be offered, the number of hugs you may receive, and the number of smiles you will have put on peoples' faces. On day six, meditate. Think about what you've experienced throughout the past week: lessons learned; opportunities granted. Think of where your life is right now and where you would like for it to be. Come up with a tentative plan of action for your life which goes beyond studies in a classroom. On day seven, it's time to get yourself back into study mode but you want to enjoy a few hours to yourself before studies begin again. Immerse yourself in a book, cook your favorite food or dessert and invite a friend over to enjoy it with you, or perhaps you might like to take in a movie or visit a park to observe those around you. Whatever the case, relax while mentally preparing yourself for the days ahead. When you arrive back to school and hear of the spring vacations others have had, you'll known deep in your soul that their vacations could never compare to yours - not where it counts, deep down in your soul. While you spent very little money, you've explored your surroundings, enjoyed physical activity, spent time with friends, and met people with challenges which opened your eyes in a way a TV show, video, or book never could. Note: You can substitute these activities with your favorites. I just went with these because these are activities I hold dear to my heart. Norma Wilkes is a writer and an editor, she works with StartSchoolNow as a freelance writer.. Click here to contact her for inquiries or friendly hellos. Bonus: here is a great video of Ashley Hudson talking about spring break staycation ideas and essentials. Enjoy it and don't forget to subscribe her channel!